The term Female Genital Mutilation (FGM) refers to all procedures involving partial or total removal of the external female genitalia or other injury to the female genital organs for cultural or other non-medical reasons. Procedures can cause severe bleeding and problems urinating, and later cysts, infections, infertility as well as complications in childbirth and increased risk of newborn deaths. More than 125 million girls and women alive today have been cut in the 29 countries in Africa and Middle East where FGM is concentrated. In June of 2008, the Egyptian Parliament agreed to criminalize FGM/C in the Penal Code, establishing a minimum custodial sentence of three months and a maximum of two years, or an alternative minimum penalty of 1,000 Egyptian pounds (LE) and a maximum of 5,000 LE. As of yet no one has been convicted according to this law. Also, the new Child Law included the formation of Child Protection Committees (CPC) at different national levels with duties to identify, support and monitor children at risk of neglect and abuse, including girls at risk of circumcision. Furthermore, to assist in the enforcement of legislation, Egypt hosted in 2008 a regional meeting entitled 'Cairo Declaration+5'. This conference is a follow-up to the 2003 meeting that also took place in Cairo and resulted in an important legal document on FGM titled 'The Cairo Declaration for the Elimination of Female Genital Mutilation'. The main objectives of the conference were to follow up on the recommendations of the pervious conference and to launch an international campaign aimed at rekindling world-wide attention on FGM. The Egyptian Ministry of Health (MoH) issued in 2007 a ministerial decree (271) closing a loophole in the previous 1996 decree by banning everyone, including health professionals, from performing FGM in governmental or non-governmental hospitals/clinics. In 2007, Grand Mufti Ali Gomaa’s issued a 'Fatwa' condemning FGM and the Azhar Supreme Council for Islamic Research issued a statement explaining that FGM has no basis in the core Islamic Sharia or any of its partial provisions. In September 2012, Egyptian gynecologists and obstetricians union launched a statement declaring that FGM is not a medical procedure and is not included in any medical curriculum else as a practice that should be prevented consequently law doesn’t offer protection to physicians who practice it. Since 2008 the UNFPA–UNICEF Joint programme to accelerate the abandonment of FGM has been engaged in a broad range of areas such as law reform, research and data analysis, capacity building of medical personnel and field workers, as well as direct engagement with local communities and religious leaders. In 2014, the UNFPA-UNICEF Joint Programme has launched a second phase, expanding its work to 17 countries. The Joint Programme is working closely with the Ministry of Health (MoH) to address the growing challenge of medicalization, reinforcement of the FGM/C ban law, and mobilizing social change at the community levels. Effective enactment and enforcement of legislation against FGM/C. Knowledge dissemination of socio-cultural dynamics of FGM/C practice. Collaboration with key global development partners on a common framework for the abandonment of FGM/C. Evidence-based data for programming and policies. Consolidation of existing partnerships and forging new partnerships. Expanding networks of religious leaders advocating abandonment of FGM/C. Media campaigns emphasizing FGM/C abandonment process in Sub-Saharan Africa, Sudan and Egypt. Better integration of the implications of FGM/C practice into reproductive health strategies. Building donor support to pool resources for a global movement towards the abandonment of FGM/C. This joint programme also supports the National Programme against FGM and Family Empowerment lead by the National Population Council and most recently, supporting the National Population Council in the implementation of the National Strategy (2014-2018). Female genital mutilation (FGM) is still widespread – but increasingly condemned – throughout much of North and East Africa. However, the recent history of the practice in Egypt presents special challenges for those trying to end it. According to the national 2014 Demographic and Health Survey (DHS), 92 per cent of Egyptian married women between the ages of 15 and 49 have undergone FGM, 72 per cent of them by doctors. 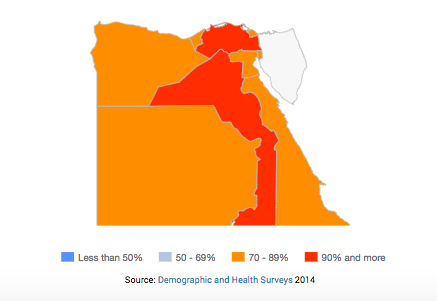 Although a positive change in women’s attitudes about circumcision has occurred, there is still widespread support for the continuation of FGM in Egypt. The 2008 DHS showed that 63 per cent of women aged 15-49 believed the practice should continue. FGM is part of the social fabric of the Egyptian community and is in some cases upheld by beliefs associated with religion. Husbands’ preferences for circumcised women and the prevention of adultery were among the most cited reasons by women aged 15-49 for supporting the practice (60 per cent, 39 per cent respectively). Capacity Building of Law Enforcement agents on FGM: UNFPA in collaboration with the NPC and the office of the General Prosecutor developed a training program for prosecutors on FGM in end 2014. In 2015, the training was expanded to include forensic experts and judges. The aim of the training is to raise awareness on all issues related to FGM and to identify gaps in the current legal proceedings and administrative oversights which hinder litigating relevant cases according to the FGM criminalizing penal code, and finally to give the appropriate tools to law enforcement personnel to avoid falling in the legal loopholes. UNFPA has been supporting the Ministry of Health & Population and the National Population Council efforts in the anti-medicalization efforts. Raising the capacity of Health Service providers at all primary health care units: In 2013 UNFPA, in collaboration with the Ministry of Health and Population, held a number of workshops and to ensure the commitment of the medical staff in Primary Health Care Units and public hospitals in the governorates with the highest FGM prevalence towards the abandonment of FGM as well as raised their capacity on FGM to deliver effective counselling and promote anti-FGM messages. UNFPA also supported the second phase of the Ministry of Health and Population capacity building programme of rural outreach workers/Raedat Rifiyat (aiming to reach an overall number of 12,000 outreach workers). UNFPA also supported the training programme of more than 350 outreach workers in collaboration with the National Program for Family Empowerment and Abandonment of Female Genital Mutilation of the National Population Council. Working with Religious Leaders, Enhancing capacities of religious leaders both Muslim and Christian to convince communities and households (through sermons, disseminated messages, teachings and family counselling) to abandon violence against women and girls with specific emphasis on FGM /C. UNFPA Egypt Country Office in collaboration with the International Islamic Center for Population Studies & Research (IISPSR) works in engaging religious leaders in development efforts addressing RHR issues, such as FP, Maternal Health, and gender based violence (GBV) including FGM. In the past UNFPA also supported the National Programme against FGM and the NGOs coalition against FGM to organize a series of trainings to build the capacity of Imams and preachers on combating gender-based violence, with focus on FGM. Strengthening community based multi-sectorial school based model, which puts girls’ development at the center of the intervention by focusing on their education and well-being programme while targeting in parallel duty bearers (parents, teachers, and religious and other community leaders) in the school catchment area by raising awareness on FGM in all the interventions. UNFPA is partnering with Noon Creative Enterprise (Noon), on an interactive street theatre show about FGM called Hara TV III which has been performed nationwide. The play comprises a number of scenes addressing FGM as part of what Egyptian girls have to endure, illustrating the phases of girlhood in one conservative community of Egypt, including undergoing FGM/C as well as the social pressure mothers experience to submit their girls to these practices. The audience is involved in a discussion afterwards, which has proved to be very effective in creating an open discussion on sensitive issues such as sexuality and marital problems. Coalition of NGOs against FGM: UNFPA supported the establishment and strengthening of the NGOs Coalition to eliminate FGM, which was recently registered in the Ministry of Social Solidarity bringing together 90 local NGOs joining forces to eliminate FGM in Egypt.